The Kent Kings’ new 2019 squad are going to the Dogs – no, that’s not a gloomy prediction for the forthcoming National League [NL] campaign! On the contrary, the septet already dubbed the ‘team of all the talents’ are anticipated to make a major challenge for honours and supporters will get their first chance to meet their new heroes-to-be at a special Speedway night at the Greyhound Meeting at the Kings’ home, Central Park Stadium on Sunday 27th. January. The team are boosted enormously too by the announcement of a major new club backer – and the 27th. will be the official launch event for this sponsor, The reveal of the sponsor, coming on board for 2019 and 2020, will be main event on the ‘Speedway at the Dogs’ night – with all seven riders who are donning the famous Invicta race jacket in the forthcoming campaign being in attendance and each having a Greyhound Race named after them in their honour, going out on track to present the spoils to the winning dog for their special race. 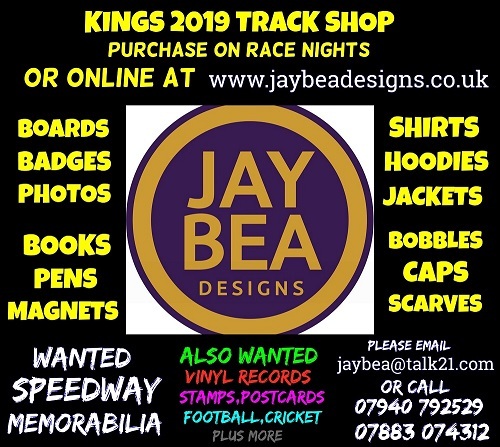 Kent Speedway fans who want to attend this very special event need to book in advance by calling the Stadium on 01795 475547 giving their details and they’ll be put on a list on the gate for the 27th. – the special rate of admission for Speedway fans booking in advance will be just £5.00, which will also include a free buffet in the Central Bar where the riders, their families and team management will be gathering for team bonding and for the very special moment when the new club sponsor will be revealed. This offer is restricted to 50 fans and it’ll be first-come, first-served – fans should call the stadium by ‘phone or in person to book during office hours, Mon-Fri 9am-5pm; Sat 10am-3pm; or during the Greyhound Meeting this Sunday. The ‘Speedway At The Dogs’/Cub Sponsor Reveal Greyhound Meeting will start at 6.00pm with the first race at 6.09pm.